Our annual meeting at the Morton Center had 47 residents in attendance and received some press coverage from Purdue and the J&C as well. Carl Griffin introduced Don Ferguson, Manager of the Senior Housing Assistance Repair Program or SHARP. SHARP helps seniors 62 or older remain independent by completing minor home repairs, correcting roof leaks, or installing wheel-chair ramps and grab bars. This Lafayette and West Lafayette organization worked on over 125 homes last year. For additional information or to help out with SHARP projects, please contact Don, 765.447.2311 x204. Carl announced that the New Chauncey Neighborhood signs will start going up between now and the end of the year. The City will begin installing the signs at 13 prime locations to bring an awareness of our neighborhood to those who live here and folks who are just passing through. The City is covering almost 50% of the $250 cost for the sign and mounting hardware, the rest will come from the NCNA. If you would like to sponsor a New Chauncey sign, please give a check for $130 to NCNA treasurer Jean Sullivan so we can recognize your contribution. 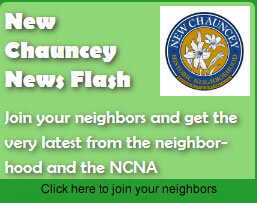 Also, the NCNA Leadership Team has commissioned a limited number of commemorative New Chauncey pins. These 1 inch pins are a replica of the New Chauncey signs and a pair of pins will be given to everyone who contributes $50 or more toward the purchase of the New Chauncey signs. Proposed zoning Ordinance #27-10 and the Area Planning Commission’s New Chauncey Neighborhood zoning and use review dominated the conversation at this year’s annual meeting. District 2 Councilor Peter Bunder spoke to his opposition to the City’s proposed Ordinance while Mayor John Dennis, City Engineer Dave Buck and Development Director Chandler Poole discussed the proposal ‘s safeguards and advantages. There were a good number of questions and a large amount of discussion about the subject. Captain Chris Leroux’s update on the 2009-2010 Calls for Service by Uniform Crime Reporting category that shows an overall decrease in calls year over year for the New Chauncey Neighborhood. Rick Walker’s update from the Neighborhood Resources Team (NRT) on code enforcement in the Neighborhood and that the NRT has begun patrolling on Home Game Saturdays to help keep the neighborhood in shape. Daniel Flavin voiced concern from Maple Street that the City is planting scrub trees in the area between the curb and sidewalk. Also when the contractor rebuilt curbs on Maple Street this summer, the contractor or Concrete Truck dumped excess concrete behind the curb. Making it difficult to plant trees or shrubs in that area. The City contract called for 4” of “good soil”. The same problem happened on N. Chauncey Street a couple of years ago.